A Crowd Of Scientists Finds A Better Way To Predict Seizures : Shots - Health News The winners of an online competition identified electrical patterns in the brain that often precede a seizure. The victors included a mathematician and an engineer, but no doctor. 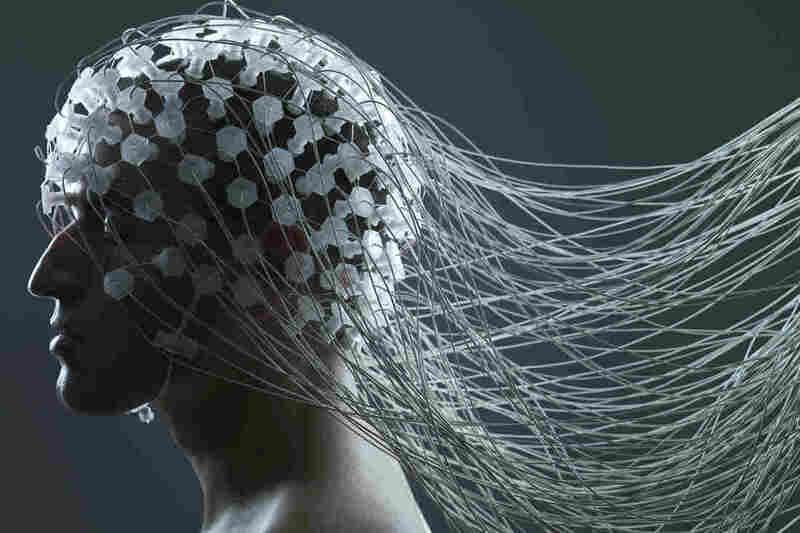 Electrodes on the scalp can reveal electrical activity in the brain associated with seizures. That "blew the top off" previous efforts, says Brian Litt, a professor of neurology and bioengineering at the University of Pennsylvania who helped oversee the competition. In the past, he says, researchers have struggled to find an algorithm that did better than chance. "This has real clinical potential," says Walter Koroshetz, acting director of the National Institute of Neurological Disorders and Stroke, a sponsor of the contest. "We'd like to develop therapies that come in when they are needed instead of people taking medicine all the time." Epilepsy, which is often compared to an electrical storm in the brain, affects nearly 1 percent of people worldwide. The most common treatment is medication, which can leave people feeling tired or dizzy. Other options include surgery and a new type of implanted device that uses electrical pulses to prevent seizures. The winning team included a mathematician and an engineer, but no doctor. A better prediction algorithm has the potential to make implanted devices more effective. Ideally, the devices would work a bit like a heart defibrillator — only delivering electrical current when it's needed. The result of the competition, announced at the American Epilepsy Society's annual meeting in Seattle, showed the value of sharing a complex problem in neuroscience with experts from unrelated fields. The winning team included a mathematician and an engineer, but no doctor. "Neuroscience needs these people to help solve our problems," Koroshetz says. The contest, with a first prize of $15,000, was sponsored by NINDS, the American Epilepsy Society and the Epilepsy Foundation. More than 500 teams entered via Kaggle.com, a website that allows researchers and companies to post data in the "cloud" for competitors to analyze, an approach known as crowdsourcing. Data came from recordings of electrical activity in the brains of both people and dogs with epilepsy. Competitors had access to hundreds of hours of recordings made before and during epileptic seizures. 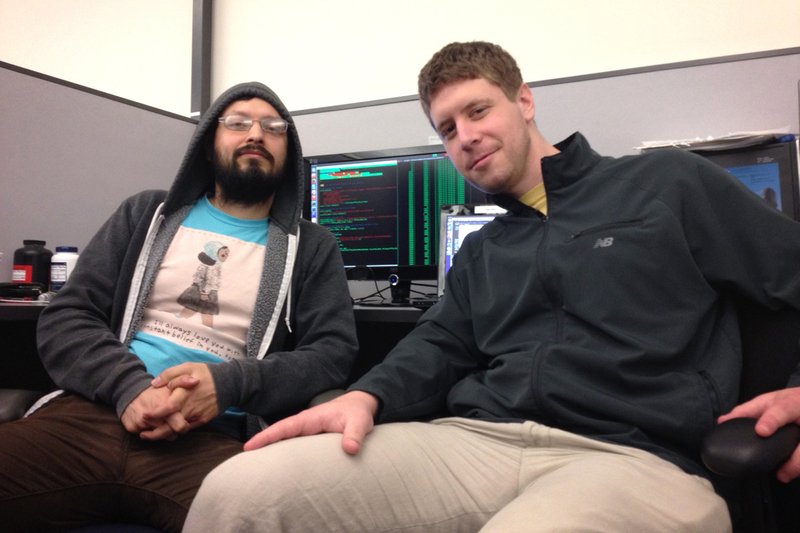 Mathematician Phillip Adkins (left) and Drew Abbot, a software engineer at AiLive. They were members of the winning team. The winning team had five members from the U.S. and Australia. The U.S. part of the team included Drew Abbot, a software engineer, and Phillip Adkins, a mathematician who knows a lot about machine learning. Both work at AiLive, a small company in California that's best known for improving the motion detection capabilities of Wii video game consoles. "The contest was simply another fun challenge," Abbot says. The hardest part, he says, was finding a way to detect useful patterns in a huge amount of data. Adkins had previously worked on an algorithm to determine blood glucose levels using laser light. But that problem required a very different approach, he says. Toward the end of the epilepsy competition, the top teams were improving their algorithms daily. "We just kept jumping up the leaderboard," Adkins says. "Hopefully we have inched medical science a step forward." NINDS and the American Epilepsy Society also sponsored a second contest with a $5,000 prize, for detecting a seizure in progress. That competition was won by Michael Hills, an Australian software engineer who developed an algorithm that was correct 97 percent of the time. A previous version of this story incorrectly said there was no brain scientist on the winning team.